This native plant is a member of the lily family (Liliaceae). It grows in open, moist woods, often in groups. 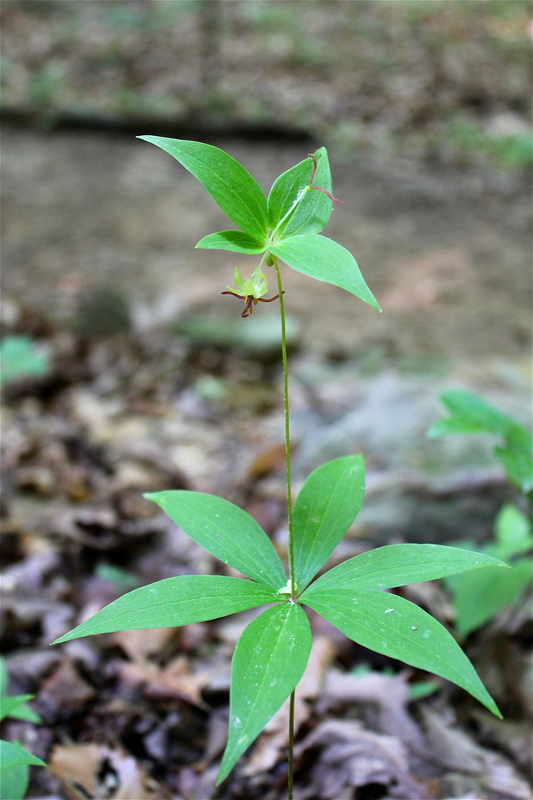 Five to nine simple leaves are gracefully whorled around a single stem. Plants that are going to flower this year put out a second tier of 3 to 5 leaves, bringing the overall height of the plant to 1-2 feet. As the photos below suggest, the small, yellow-green flowers of indian cucumber hang down from the upper tier of leaves, so you have to go out of your way to admire them. Look closely and notice how the light green petals of the nodding flower fold backwards, revealing three long, red styles and several stamens. The color contrast and overall morphology are quite exotic! The flowers appear in May and June. Later in the season, indian cucumber produces dark purple berries that are not edible. However, as the name implies, the roots of this plant ARE edible and apparently taste like fresh cucumbers. Try to hold off snacking on this plant! Indian cucumber is endangered in some parts of its East Coast range.